Launched in 2002—just a year after the English Wikipedia was launched—Odia Wikipedia has grown to be the largest content repository in the Odia language available in Unicode on the Internet. With over 8,900 articles and about 17 active editors (also known as “uikiali”) spread across various parts of India and abroad, the project has become more than just an encyclopedia. The voluntary editor community has put its efforts into acquiring valuable content, re-licensing them under Creative Commons (CC) licenses, and building tools for acquiring more encyclopedic content from various sources. The community has also engaged over 2,500 people through various outreach programs, such as the Wikipedia Education Program. For its thirteenth anniversary, the community released a character-encoding converter that promises to unlock massive amounts of content—from government portals to journals, newspapers and magazines that have their content in various legacy encoding systems other than Unicode. This has been a major roadblock in the search for and reuse of digital content in the Odia language. During our thirteenth anniversary celebrations, the community spent a day assessing community needs, addressing issues, and identifying priority areas to focus on in the future. This was arguably the first time almost the entire community gathered in a physical space. This allowed Odia Wikipedia administrator, and the most active Odia Wikimedian, Mrutyunjaya Kar and I to design a needs assessment survey. Participating Wikimedians were asked to brainstorm various problems they face in two major areas: editing and outreach. 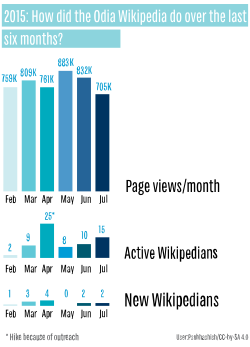 Two-fifths of participants said that problems with the rendering of Odia characters in different operating systems, ignorance or lack of more documentation about enabling encoding for Odia, input methods and keyboard layouts, and other font- and keyboard-related issues as the major reason for low readership and contribution on Wikipedia. More than a third instead blamed the lack of good quality content on Wikipedia and the Internet as a whole in the Odia language, in English related to Odia language, and in Odisha on the Internet. A quarter blamed other technical issues, including the lack of mobile input in Odia, for low editorship, while low interest for contributing in Odia language by native language speakers was blamed by eight percent of survey participants. 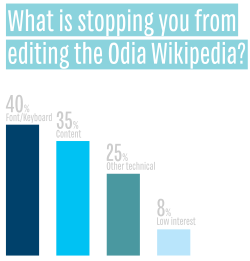 Aditya Mahar, the second-most active editor on the Odia Wikipedia, feels that the biggest setback for the Odia Wikipedia is a lack of interest in contributing in Odia language. He says many Odia speakers feel that Odia is not needed to acquire and share knowledge. He adds that he is concerned by the way many have been alienating Odia with the excuse of learning English to connect to the rest of the world. “I want my future generation to find everything they want to learn in Odia—from the history of Odisha, our art, architecture, Odia language and people, and our cultural extravaganza,” he says. Mrutyunjaya Kar, an administrator on the Odia Wikipedia and the most active contributor, feels that Wikipedia is like a marathon and there is a great need for fresh blood in the community. Asked if the community will ever die out, Mrutyunjaya feels that even with a small community, the Odia Wikipedia community is always going to thrive, even if, in the worst case, only one active Wikipedian remains. So, we badly need new users to pass the baton. For him, community support and bonding with the fellow editors is the most important thing to lead a community. Mrutyunjaya adds that creating many short articles, known as “stubs”, is a necessary evil and essential for a project like the Odia Wikipedia, as they are drafted as a by-product of collaborative editing.